In a large mixing bowl sift together 1 cup GF oat flour and 1 cup GF all purpose flour. In a medium mixing bowl, use a fork or your hands to mash the peeled bananas. Add mashed bananas, chocolate chips and liquid coconut oil to the dry ingredients and mix gently, being careful not to over-stir. Spoon mixture into a lightly oiled 5 x 9 inch loaf pan. 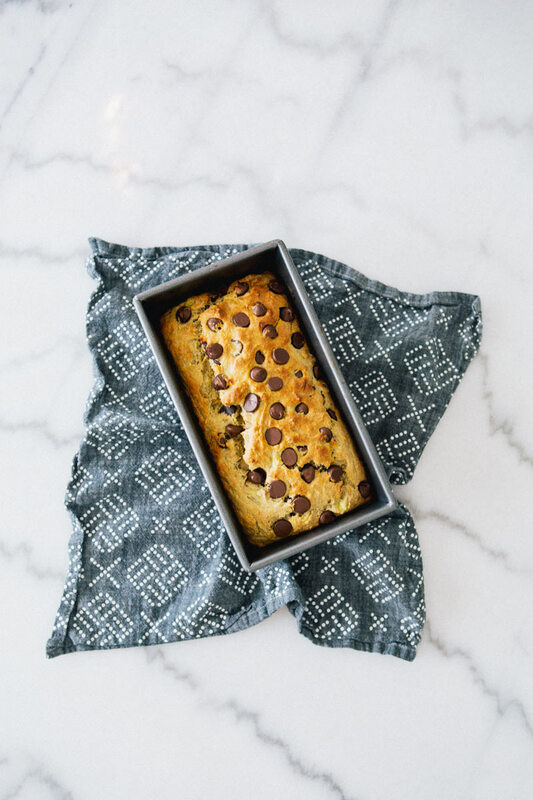 Add extra chocolate chips on top (optional but strongly suggested!). Bake for 20-30 minutes, until top is lightly browned and a toothpick can be inserted and removed batter- free! that looks beyond delicious! I need to start baking in the morning before it gets too hot! Oh wow, this looks delicious!! I’m sorry to hear about Carlos, I hope in a way that you find peace knowing his suffering has ended. It was certainly like that when my grandma passed. Oh this looks delicious! Thanks for sharing! Peace to you and your family. I’m so sorry…and I love your message of friendship and happiness and cake. I’m so sorry for your loss. My thoughts are with you during this difficult time. Baking is most certainly therapeutic. 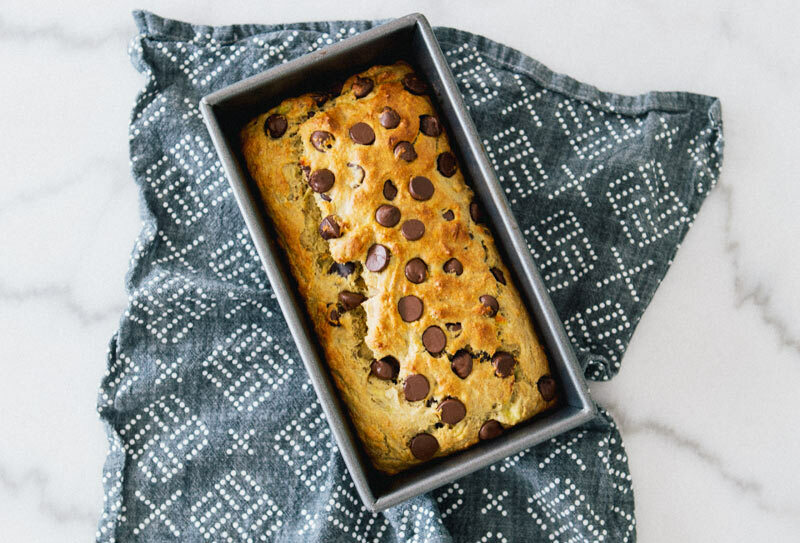 Banana bread is a favorite in our house but this version looks delicious. Thanks for sharing. Wishing you peace and comfort during this difficult time. Hugs to you. This look absolutely amazing! I love that there is no added sugar! I just made a cherry almond gluten free but it had sugar or actually truvia.. boo 🙁 I am DEFINITELY making this bread this weekend! Carlos had such a beautiful face. For your heart to be this heavy, it must be filled with love. That love never dies. My deepest sympathy to you and Lou. I’ve been following your blog for a while, but I just wanted to express my sadness for you and your family. I wish you kindness and peace right now. One of my close friends has had some health problems recently and has eliminated gluten from her diet to feel better. Thank you for giving me the opportunity to brighten her day – I cannot wait to make this for her! So sorry to hear of your precious loss. How fortunate that Carlos had such loving spirits with him in his finally days. Courage. Hi Sarah I saw it on your instagram page and just so you know I’ve been praying for your family. Death of a loved one is never easy; I lost my aunt three months ago and I still haven’t really accepted it. As you say life does go on, and it’s important that we reflect on all the good times we had with our loved one before their passing. I wish you all the best! 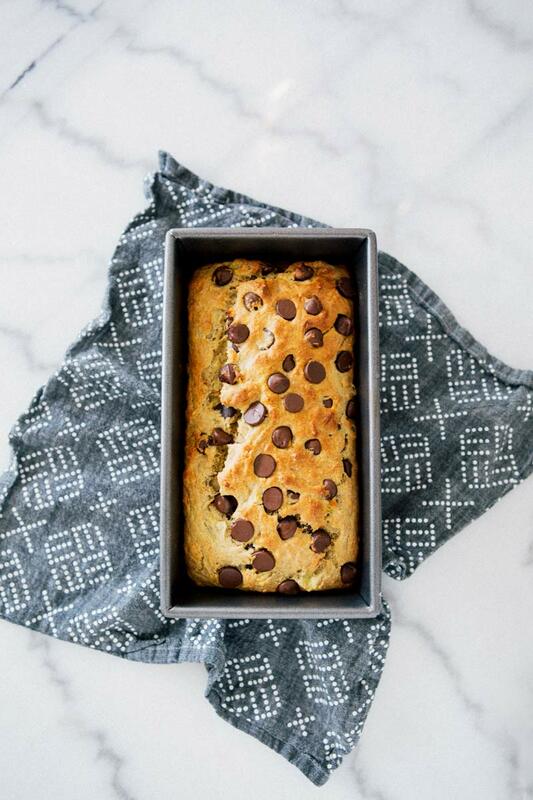 So glad to see this banana bread which looks so delicious. I always come to your blog for the photography and the recipes. My heart skipped a beat as I read your words about the passing of Carlos. I am genuinely so sorry. I know your hearts are heavy now. Just keep your memories with you always and that will help. God rest Carlos’ soul and give you all peace. Totally OMG worthy – this looks amazing! Looks so yummy. 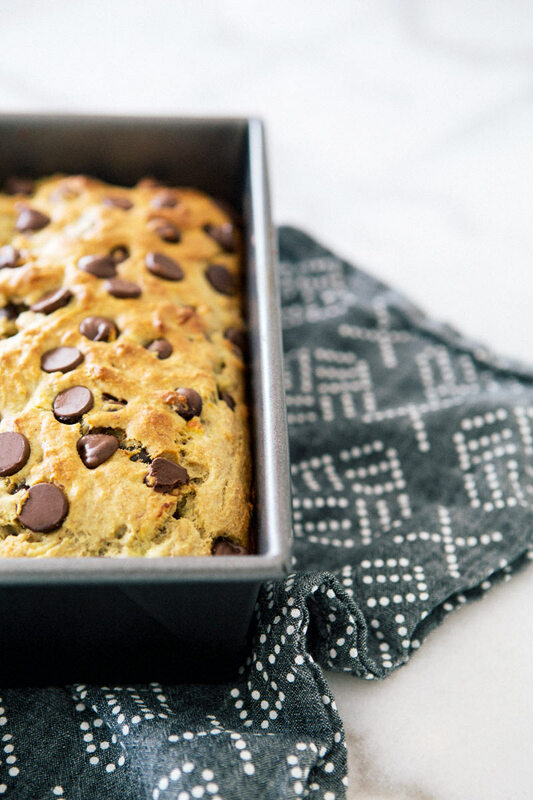 Banana bread has always been one of my favorite desserts. So ready to try this. Thanks so much Sarah!! Sorry to hear about Carlos. He was surrounded by so much love till the end. 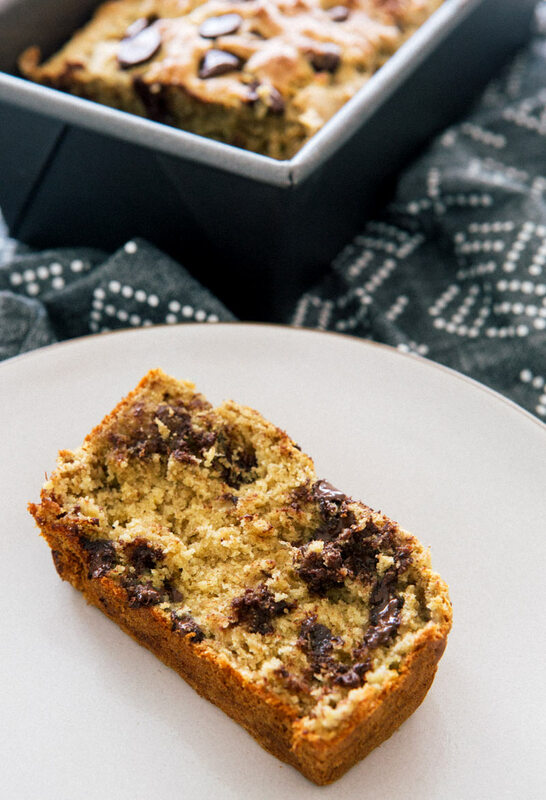 Thanks for sharing and for the banana amazingness. I’m so sorry to hear about Carlos. I’m thankful he is no longer suffering but I know how heavy your hearts are right now. Becoming a care taker is the hardest thing in the world. It’s also a true test of character. You both gave so much of yourselves to Carlos. That’s what love truly is. Carlos took a lot of love with him when he left on his next journey, even from complete strangers. Wishing you both love and blessings. Why not give us an idea of how many cups your three bananas are? Guessing can’t be good for replicating this bread. 1. Can i replace the oat flour with chickpea flour? 2. How long does it keep? Delicious!! Loved by all! Went so fast..going to make all the time…didn’t add chocolate, just some chopped walnuts. Do you think the banana could be replaced with carrot? Or maybe pumpkin puree or zucchini? Hi! Just made this bread 2ce. Couple of questions. The first time around it was not ready in 30 minutes, I left it in for 45. It was great but was a little dry. This time around I used 4 bananas to make it more moist. After 30/40 min it was still raw. It’s currently on the oven going on 50. What do you suggest to get it more moist without letting it become too dry? Also are my cooking times off? Thanks! Tried a modified version and the results were lovely. Glad to find a simple gluten-free recipe! Tried to make this tonight but with coconut flour, it seemed really dry.. it’s in the oven right now! Hoping it turns out ok! Thanks for this idea!! My husband has practically eaten the entire loaf. I followed your recipe and needed to add a little water before pouring into the baking dish. I also lined my baking dish with parchment – it worked out excellent. I also added chopped walnuts. Oh, and I only needed two large bananas. The loaf is almost GONE! It was DEEEELISH! wondering how much dried cranberries can be used in place of the choc. chips. and even to add nuts if possible. what do you suggest? Made these as cupcakes. Put them in for 18 minutes @ 375. They looked and tasted delicious. Excellent way of describing, and good paragraph to obtain facts about my presentation focus, which i am going to convey in school.